Tryon Palace was built in New Bern at the request of William Tryon, a British soldier and colonial administrator. After taking office, he worked with architect John Hawks on the design, as a centrally located government building. By 1770, the building was finished, and Tryon moved in, before leaving to become the governor of the Province of New York just a year later. 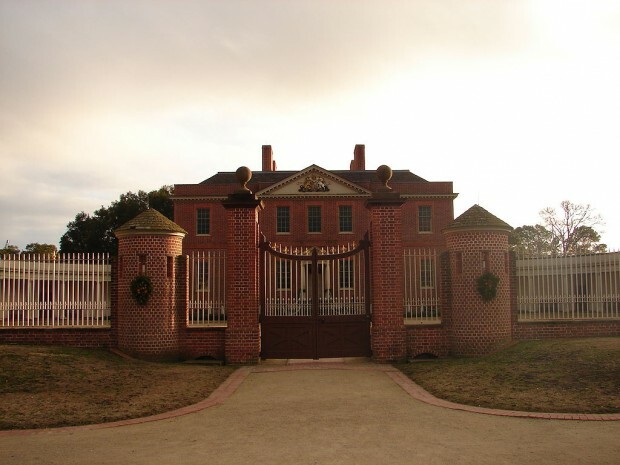 In 1775, near the beginning of the American war for independence, patriots took control of the Tryon Palace, and used it as the State capitol building. When Raleigh became the capitol some 18 years later, the palace was put to use in other ways, including a boarding house, school, and Masonic lodge. A fire in 1798 destroyed all but the Kitchen & Stable Office, and the kitchen was dismantled in the early 1800s. In the late 1930s, a movement was begun to restore & preserve colonial New Bern, boosted further by the discovery of the original Tryon Palace plans. In rebuilding at the original place they faced monumental obstacles, including the removal of 50 buildings, rerouting North Carolina Route 70, and building a new bridge over the Trent River. When they finally were able to begin the building & restoration, they found the original foundation directly underneath where the old highway had been. After years of painstaking work, in 1959, the Tryon Palace opened to the public. Today, Tryon Palace is one of North Carolina’s finest historical sites, with its accompanying History Center and museum. Central to the whole experience is of course the palace. Demonstrations & guided tours are given by costumed reenactors, who bring history to life, and life to history. The grounds have more than two dozen features, which include acres of magnificent gardens, historic buildings, a performance hall, a playground, a café, education centers, and more. See a map of Tryon Palace’s grounds here. Special events occur frequently, so you should check their calendar before planning your visit. Tryon Palace is open 9 am–5 pm Monday through Saturday, and noon–5 pm Sunday. Building tours have differing times, which you can find here. Admission is $20 for adults & $10 for grades 1–12 for a full pass to everything, $12/$6 for a galleries pass (museum, History Center, and gardens), and $6/$3 for the gardens pass. More info here.